The Indiana Genealogical Society now has 1,314 databases in the Members Only area. Each of Indiana's 92 counties has at least 5 databases. The Indiana Genealogical Society has added the August 2014 issue of IGS Newsletter, the society's bi-monthly newsletter for IGS members, to the Members Only area. IGS members must login to the IGS Records section to get their copy. This issue details the various genealogy TV shows on tap for this year, as well as a reminder of the role the church played in the lives of our ancestors. There are also genealogy news items from around the state and some national items of interest. The Northwest Indiana Genealogical Society will meet on Saturday, August 16 at 10 am at the Valparaiso branch of the Porter County Public Library (103 Jefferson St., Valparaiso IN). Laurie Kender will give a presentation on researching your English ancestors, beginning with a brief background of English history to give you an understanding of what records are available and why they were created. Mortality schedules were special schedules to the federal census that were taken in 1850, 1860, 1870 and 1880. The 1860 mortality schedule listed those who had died between 1 June 1859 and 31 May 1860. The Indiana Genealogical Society now has 1,312 databases in the Members Only area. Each of Indiana's 92 counties has at least 5 databases. A cemetery tour of the Historic Estates of Serenity Cemetery in Marion (formerly the I.O.O.F. Cemetery) will be given on Tuesday, August 19 at 6 pm. Karen Niverson, director of the Grant County Convention & Visitors Bureau, along with Sue Bratton from the Marion Public Library, will talk about some of the "industrial giants, heroes and rascals" buried there. Participants should meet at the cemetery (1101 S. Lincoln Blvd., Marion IN). This tour is free and open to the public. It is part of a Cemetery Education & Restoration Series, which was made possible by a Historic Preservation Education Grant from Indiana Landmarks, Indiana Humanities and the National Endowment for the Humanities. The Indiana Genealogical Society now has 1,311 databases in the Members Only area. Each of Indiana's 92 counties has at least 5 databases. The Kosciusko County Historical Society's Genealogy Library will host a program about Civil War research on Saturday, August 16 from 1 to 2 pm at the Old Jail Museum (121 N. Indiana, Warsaw IN 46580). Ron Darrah from the Indiana Genealogical Society will discuss Civil War genealogy research and share information about the Society of Civil War Families of Indiana, a lineage society. There will be a question and answer session afterward. This program is free and open to the public - to reserve your seat, please call (574) 269-1078 or e-mail librarian@kosciuskohistory.com. The KCHS Genealogy Library is open Wednesday through Saturday from 10-4. The Indiana Genealogical Society now has 1,309 databases in the Members Only area. Each of Indiana's 92 counties has at least 5 databases. The Southern Indiana Genealogical Society will meet on Thursday, August 7 in the Strassweg Auditorium of the New Albany-Floyd County Public Library (180 W. Spring St., New Albany IN). Joe Hardesty, Kentucky history and genealogy librarian at the Louisville Free Public Library, will present a session, "US Federal Census Records: What They Can Tell About Our Nation and Our Ancestors." Mr. Hardesty will trace the development of the census record and explain how its changes reflect the historical, political, economic and social direction of the country. He will also discuss the supplemental schedules for agriculture, manufacturing, mortality, slave, and veterans, which are sometimes overlooked by researchers. Program time is 7 PM - for more information, please visit http://www.rootsweb.ancestry.com/~insigs/nextmeet.htm. The Hamilton East Public Library in Noblesville will hold a genealogy roundtable on Tuesday, August 12 from 2:15 to 3:15 pm in the library's genealogy classroom. This is an informal discussion group and no registration is required - bring your genealogy questions and the group will answer them. The Marion Public Library will host a session about cemetery preservation on Tuesday, August 5 at 6 pm in the library's Meeting Room B. John Bry, DeKalb County Historian (who holds a M.S. in Historic Preservation from Ball State University) will talk about new approaches to cemetery preservation, including how to get community leaders involved. This session is free and open to the public. It is part of a Cemetery Education & Restoration Series, which was made possible by a Historic Preservation Education Grant from Indiana Landmarks, Indiana Humanities and the National Endowment for the Humanities. The Indiana Genealogical Society now has 1,307 databases in the Members Only area. Each of Indiana's 92 counties has at least 5 databases. The Genealogy Center of the Allen County Public Library in Fort Wayne will hold a free session on using the Periodical Source Index (PERSI) on Wednesday, August 13 from 3 to 4 pm in the library's Meeting Room A. Cynthia Theusch will demonstrate how to use PERSI at its new online home, FindMyPast.com, and how you can find items mentioned in genealogical and historical newsletters, quarterlies, journals and magazines. This session is part of their "Digital Discoveries" series. To register, please e-mail Genealogy@ACPL.info or phone (260) 421-1225. The Hamilton East Public Library in Noblesville will hold a free workshop on using the databases on Fold3 [military records] and American Ancestors [New England Historic Genealogical Society] on Wednesday, July 23 from 9:30 am to noon in the library's computer training lab. This is a hands-on workshop - after the demonstrations, participants will be able to research their own ancestors. LEU credits are available for Indiana librarians. This workshop is free but registration is required - register through the library's calendar of events on their website (www.hepl.lib.in.us or phone (317) 776-6939. The Northwest Indiana Genealogical Society will hold a free class on using Find A Grave on Saturday, July 19 at 10 am at the Crown Point Public Library (122 N. Main St., Crown Point IN). Linda Novotny and Marlene Polster will show you how to navigate the Find A Grave website, a free resource that was created to help find and record information about the final resting places of loved ones around the world. Sometimes contributors will include photos of the tombstone and of the person, as well as additional information about their family. Novotny and Polster are both clerks in the Genealogy Department of the Valparaiso Public Library. Polster is also the Lake County Genealogist. This class is free and open to the public. This is a premium database, accessible only to IGS members. It is courtesy of Randi Richardson. The Indiana Genealogical Society now has 1,306 databases in the Members Only area. Each of Indiana's 92 counties has at least 5 databases. The Indiana Genealogical Society now has 1,305 databases in the Members Only area. Each of Indiana's 92 counties has at least 5 databases. The Indiana Genealogical Society now has 1,304 databases in the Members Only area. Each of Indiana's 92 counties has at least 5 databases. 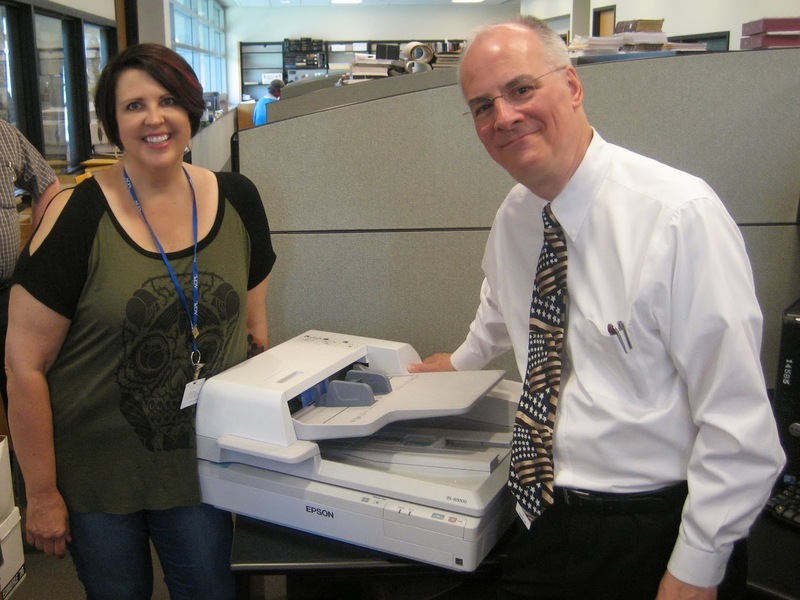 The Allen County Genealogical Society of Indiana has donated a new high capacity document scanner to the Genealogy Center at the Allen County Public Library in Fort Wayne. Pictured is ACGSI President Nancy Kucharshi with Genealogy Center Manager Curt Witcher. The Genealogy Center will use the $2,200 unit, which is capable of scanning large documents, to digitize its family history records for online public access. The Indiana Genealogical Society now has 1,303 databases in the Members Only area. Each of Indiana's 92 counties has at least 5 databases. My family records indicate that Samuel Wynkoop (gg grandfather) died in the Poor Farm in Decatur County, Indiana, Dec. 6, 1897. There is some indication that his wife, Rebecca Hetrick Wynkoop, also died there. Are there records from this Poor Farm to verify this? The Indiana Genealogical Society now has 1,302 databases in the Members Only area. Each of Indiana's 92 counties has at least 5 databases. The Indiana Genealogical Society has added the June 2014 issue of Indiana Genealogist, the quarterly publication for our members, to the IGS Records section of the Members Only area. The issue is available for download in its regular size, as well as in a compressed version for slower Internet connections. The quarterly is a premium database, accessible only to IGS members. Members have access to issues going back to 2010. The Indiana Genealogical Society now has 1,301 databases in the Members Only area. Each of Indiana's 92 counties has at least 5 databases. The Indiana Genealogical Society now has 1,300 databases in the Members Only area. Each of Indiana's 92 counties has at least 5 databases. The Hammond Public Library in Lake County will hold a free class, "Resources for Indiana Genealogists," on Saturday, July 12 at 10 am Central in the library's Lois Bell Room. Marlene Polster, President of the Northwest Indiana Genealogical Society and the Indiana County Genealogist for Lake County, will present various resources for genealogy researchers looking for records about Lake County and Indiana in general. The class is free and no registration is necessary - for more information, please contact Mary Schons - phone (219) 931-5100 extension 327. The Indiana Genealogical Society now has 1,295 databases in the Members Only area. Each of Indiana's 92 counties has at least 5 databases. The Genealogical Society of Marion County will meet this Saturday, July 12 from 1 to 3 pm at their library in Indianapolis (9350 E. Washington St., Indianapolis IN). Ron Darrah will present a program on Civil War genealogy research, in honor of the 150th anniversary of the Civil War. The meeting is free and open to the public - refreshments will be served.